MINSK, 18 April (BelTA) – Minsk and Hanoi have plans to cooperate in transplantology, Chairman of the Healthcare Committee at Minsk City Hall Igor Yurkevich said at a meeting on 18 April, BelTA has learned. Igor Yurkevich noted that the memorandum signed between the Healthcare Committee of Minsk City Hall and the Hanoi Healthcare Department, and between Minsk City Clinical Hospital No. 9 and Hanoi Kidney Disease Hospital will lay the foundation for cooperation. “In April, the Vietnamese government signed a decree regulating the development of transplantology in the country. This is why our military hospital is interested in training Vietnamese specialists both at our facilities and on the territory of Vietnam,” Igor Yurkevich added. Plans have been made to organize joint training of specialists at Minsk City Clinical Hospital No. 9. Alternative medicine courses will be taught as part of the program. “There is an eastern medicine center at Minsk City Hospital No. 10. 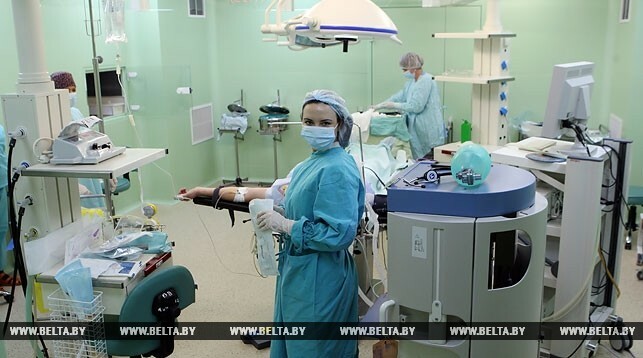 In the near future, Belarusian medical specialists will undergo training in China. They will also be invited to improve their patient rehabilitation skills in Vietnam,” Igor Yurkevich said. Besides, there are plans to set up a joint health center in Hanoi. “Our specialists could work at a Vietnamese healthcare institution on a rotational schedule in the fields of their interest (transplantology, haematology, and others),” the Chairman of the Healthcare Committee said. He added that the possibility of delivering to Minsk special equipment for stereotactic radiosurgery of brain disorders called ‘gamma knife' is under consideration. The machine treats brain cancer without invasive surgery. The Healthcare Committee of Minsk City Hall and the Healthcare Ministry are considering whether to place the equipment in Borovlyany or at a medical institution in Minsk. “Gamma knife allows for treating tumors without opening the skull. By the way, renowned opera singer Dmitri Hvorostovsky underwent gamma knife surgery,” Igor Yurkevich pointed out.